William "Vilim" Feller (July 7, 1906 – January 14, 1970), born Vilibald Srećko Feller, was a Croatian-American mathematician specializing in probability theory. Feller was born in Zagreb to Ida Oemichen-Perc, a Croatian-Austrian Catholic, and Eugen Viktor Feller, who was born to a Polish Jew named David Feller and an Austrian named Elsa Holzer. Eugen was a famous chemist and created Elsa fluid named after his mother. According to Gian-Carlo Rota, Feller's father's surname was a "Slavic tongue twister", which William changed at the age of twenty—but as can be seen, this claim was false. His christened name, Vilibald, was chosen by his Catholic mother for the saint day of his birthday. 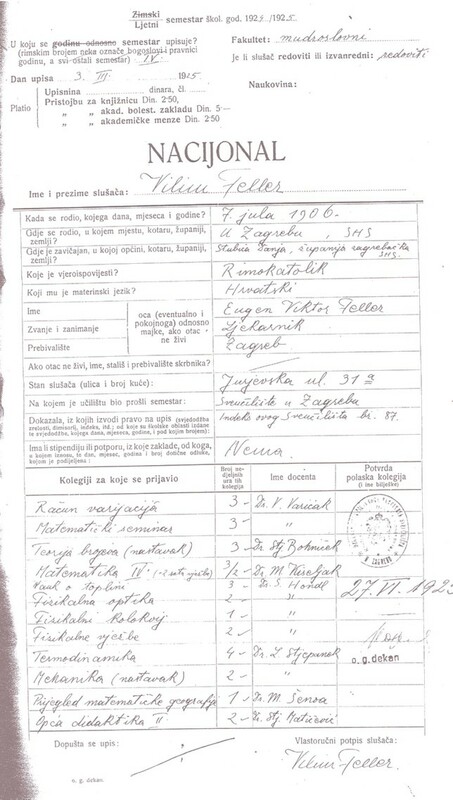 In his school documentation, the small municipality of Donja Stubica in Zagorje is mentioned. This is the birthplace of his father, who was an apothecary and owner of a company producing hygienic utensils and cosmetics. William finished his elementary and middle education in Zagreb, as well as two years of his math study. From 1925, he continued his study in Göttingen, Germany where he gained the doctoral degree in 1926 under the supervision of Richard Courant, with his work Über algebraisch rektifizierbare transzendente Kurven. Feller held a docent position at the University of Kiel beginning in 1928. Because he refused to sign a Nazi oath, he fled the Nazis and went to Copenhagen, Denmark in 1933. He also lectured in Sweden (Stockholm and Lund). As a refugee in Sweden, Feller reported being troubled by increasing fascism at the universities. He reported that the mathematician Torsten Carleman would offer his opinion that Jews and foreigners should be executed. Finally, in 1939 he arrived in the U.S. where he became a citizen in 1944 and was on the faculty at Brown and Cornell. In 1950 he became a professor at Princeton University. The works of Feller are contained in 104 papers and two books on a variety of topics such as mathematical analysis, theory of measurement, functional analysis, geometry, and differential equations in addition to his work in mathematical statistics and probability. Feller was one of the greatest probabilists of the twentieth century, who is remembered for his championing of probability theory as a branch of mathematical analysis in Sweden and the United States. In the middle of the 20th century, probability theory was popular in France and Russia, while mathematical statistics was more popular in the United Kingdom and the United States, according to the Swedish statistician, Harald Cramér. His two-volume textbook on probability theory and its applications was called "the most successful treatise on probability ever written" by Gian-Carlo Rota. By stimulating his colleagues and students in Sweden and then in the United States, Feller helped establish research groups studying the analytic theory of probability. In his research, Feller contributed to the study of the relationship between Markov chains and differential equations, where his theory of generators of one-parameter semigroups of stochastic processes gave rise to the theory of "Feller operators". Numerous topics relating to probability are named after him, including Feller processes, Feller's explosion test, Feller–Brown movement, and the Lindeberg–Feller theorem. Feller made fundamental contributions to renewal theory, Tauberian theorems, random walks, diffusion processes, and the law of the iterated logarithm. Feller was among those early editors who launched the journal Mathematical Reviews. ^ Rota, Gian-Carlo (1996). <span />Indiscrete Thoughts<span />. Birkhäuser. ISBN 0-8176-3866-0. ^ O'Connor, John J.; Robertson, Edmund F., "William Feller", MacTutor History of Mathematics archive, University of St Andrews . ^ "Biography of William Feller". History of William Feller. Retrieved 2006-06-27. ^ Siegmund-Schultze, Reinhard (2009). Mathematicians fleeing from Nazi Germany: Individual fates and global impact. Princeton, New Jersey: Princeton University Press. pp. xxviii+471. ISBN 978-0-691-14041-4. MR 2522825. ^ Preface to his Mathematical Methods of Statistics. ^ Page 199: Indiscrete Thoughts. ^ Wolfowitz, J. (1951). "Review: An introduction to probability theory and its applications, Vol. I, 1st ed., by W. Feller" (PDF). Bull. Amer. Math. Soc. 57 (2): 156–159. doi:10.1090/s0002-9904-1951-09491-4. ^ "Review: An introduction to probability theory and its applications, Vol. I, 2nd ed., by W. Feller" (PDF). Bull. Amer. Math. Soc. 64 (6): 393. 1958. doi:10.1090/s0002-9904-1958-10252-9. O'Connor, John J.; Robertson, Edmund F., "William Feller", MacTutor History of Mathematics archive, University of St Andrews . "Fine Hall in its golden age: Remembrances of Princeton in the early fifties" by Gian-Carlo Rota. Contains a section on Feller at Princeton. 1992: Howard E. Simmons, Jr.